Children will change. Family will change. Community will change. Society will change. Nurture wisdom to change society, courage and powers! and “things can’t remain as they are”, “awareness” to “actions”. All mankind faces the different environmental problems such as global warming, destruction of forests, marine pollution and waste products. The mass media covers critical situation of environmental problems almost daily. However, our action to solve the problems is not so rapid. Environment problems are too big for us to imagine a relationship between our small actions and global environmental problems. This may be a major cause to cloud our actions and delay a solution of the problems. 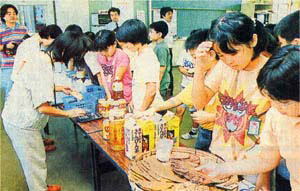 Therefore, Okinawa Citizens Recycling Movement wanted to begin work to be aware of a relation between “our daily lives and environment” with children. If we can imagine the relation between our daily lives and nature better, it surely will change our actions and give the power to change a society. Although many of the participants felt that “I agree” and “I have to do something about this” on the spot, they could not seem to keep the same feeling and move into action. It may be correct to say that they could not “change” rather than “move into action”. It is very difficult to break away from the convenient and easy life for grown-up people who are used to such life. If we know the need of environment-friendly life from childhood and more children look for and put in practice what they can do, society in the next ten years or 20 years would look hopeful. Having such a dream, we wanted to have the learning opportunities about environment with children and began to plan the “Shopping Game” from about 1999. Just at that moment, full realization of “the period of integrated study” was decided and thus our office received phone calls, e-mails and calls requesting information on “garbage” and “recycle” from school teachers and students more frequently. While answering to each one of them, we were convinced that if we make a suggestion to conduct environment study program, we could avoid perfunctory studies. We want to use our know-how of citizens’ movement for the “creation of power to live” which is purpose of “integrated study”. The point of this program is that children will take the central role in future environment. Taking a look at not only environmental but also the entire society through the game, we hope that children will be aware of many things such as their connectedness to others, and recognize the need to solve problems from local to global scale. 2. What is Shopping Game? d based on past experience of activities by Okinawa Citizens Recycling Movement, which has engaged in educational activities as the environmental NGO for nearly 30 years. Since 1999, we provide the program to about 2000 students of elementary schools in Okinawa mainly, from outside the prefecture and overseas every year. 600 classes were conducted for over 20 thousand students and we have received favorable comments. It is a role-playing game to experience shopping in the classroom by providing mimic shops and using educational materials of a perfect likeliness of the real things. Even a child can have fun doing, think and make a presentation. This program gives children hands on learning. Enormous quantities of garbage that we produce daily are generated by using valuable resources and energy. In order to understand such simple things and take actions what children can do, garbage produced associated with daily shopping is decided to be used as teaching material. Children are divided into group of five or six members and they purchase ingredients such as carrot, potato, onion, meet and curry blocks, on the assumption that they make their favorite curry rice. Next each group has time to think about amount and quality of garbage, disposal procedures, disposal cost and effect on the environment, by focusing on package and wrapping attached to the ingredients. Once they understand current situation of garbage, think of ideas to reduce waste during “game plan time”. The program is in the form of workshop and each one in group comes up ideas, they form ideas and make a presentation. ・”I found out taking out garbage will cost this much”. ・”I was surprised when I get much change with shopping, the waste disposal cost is high”. The environment study program “Shopping Game” won the award for excellence in “The Sixth Green Purchasing Awards” in 2003. Green purchasing, which the Ministry of the Environment is taking the lead in promotion, is to choose products or services with least adverse impact on environment, with careful consideration of environment and whether they are needed or not before purchasing. And in 2004, the “Eco- Shopping Game” was published in the nation. Not only many NPO introduced the program but also in some prefectures the local governments began to deal with this. In foreign countries, we support leader training and dissemination of the programs in cooperation with local governments of Viet Nam and Malaysia as well as with NGOs operating there.